All children should be protected by the UN Convention on the Rights of the Child, and children with disabilities should also be protected by the UN Convention on the Rights of Persons with Disabilities. Both conventions are examined extensively in this book. It focuses on a child’s participation rights and therefore their rights to makes choices about their health, education, home life and relationships, and how those rights are promoted and safeguarded. Children are not always assured participation rights and there is frequent examination of case law in various European states. Through this, readers are stimulated to reflect on their own understanding and practice. 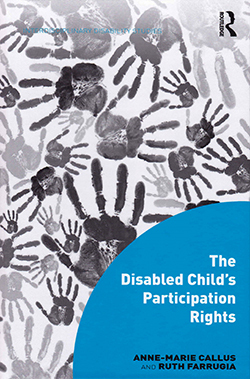 This is a reference book on disability studies and childhood studies for the library. It is a book for those whose primary focus is with children with various disabilities and therefore how to consider the challenge of hearing all too often rarely heard voices.